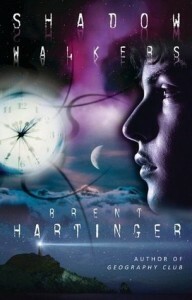 Brent Hartinger, 2011. Zach might be gay – he thinks he probably is – but right now he has something more important on his mind. His little brother is missing, and Zach’s the only one who can find him, with the help of a mysterious incense that allows him to visit the astral dimension…..where he meets a cute boy. The story moves along quickly and the gay content is done nicely, but overall, Hartinger doesn’t live up to the promise he displayed with Project Sweet Life (2009) or Geography Club (2003). This is almost entirely because he doesn’t trust the reader enough, spoon-feeding us every bit of info about the story, not letting us draw any conclusions on our own. Still, a decent entry into the paranormal queer YA oeuvre. This entry was posted in 2011, Brent Hartinger, fantasy, gay male, problem novel, queer protagonist, secondary queer character. Bookmark the permalink.